"Spanish is fun, so give it a try. Hola is hello, adiós is goodbye. A dog is a perro, a cat is a gato. You drink from a vaso and eat from a plato..."
My first book is a rhyming non-fiction book in English, which happens to introduce 70 Spanish words in a funny way. I am very proud of this one. Illustrations on this page are copyrighted by Loretta Lopez 1996. "Sunny illustrations and a rhyming text introduce 70 Spanish words in surprisingly straightforward English sentences: "A dog is a perro/ a cat is a gato./ You drink from a vaso/ and eat from a plato." In addition to providing translations for those who need more help than is supplied in the decidedly Western-flair illustrations, the glossary also ensures that the newly bilingual get the pronunciation right. The progression of determinedly happy pictures begins to spring surprises midway through the book; these are sometimes simply amusing ( a UFO appears over the increasingly chaotic action) and sometimes verging on the surreal (a fiesta-loving shark swings a bat). The text also includes words (burrito, piñata, mosquito) that are identical in the two langauges. Outwardly, this book by two newcomers looks like a language lesson from Looney Tunes. Then - !Sorpresa! - it turns out to be innovative, useful, and fun." language . . ." - Maria Redburn, Irving Pubic Library, TX. "A fiesta of lively language fun, perfect for spicing up a story hour or sneaking in a first Spanish lesson." "Want to learn Spanish the fun way? Then read this cleverly illustrated book that presents Spanish words in verse. Each brightly colored page is filled with humorous drawings that emphasize the definition of each Spanish word. Bi-lingual story-tellers should find the book helpful. The read-to-me crowd will be fascinated with the delightful pictures and will enjoy the challenge of another language. A glossary gives the correct pronunciation of all 70 words." "Hola is hello, adios is good-bye. Spanish is fun, so give it a try."" "Susan Middleton Elya makes learning more like a game than a chore . . . Loretta Lopez's illustrations add to the whimsy." "Say Hola to Spanish is a cheerfully illustrated introduction to the language that young children, especially those who have heard Spanish spoken before, should love. Its simple rhymes teach familiar words . . . at a perky pace matched by a colorful picture parade of people, animals, and even a strutting cactus. (My) older child really liked the picture of the shark wearing a sombrero and enjoyed learning the Spanish word for cowboy (vaquero). In the ultimate thumbs up, he asked to hear the book read again the next night, and both kids seemed to enjoy it even more. . . . The experience was a positive one that may someday lead to learning the language. In the meantime, it helps them appreciate a little more their life in New Mexico.
. . . 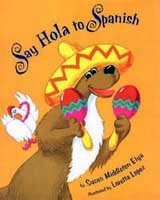 Even if you don't care if your kids learn Spanish, they'll enjoy the rhymes and merriment of this sunny book." "A book to enjoy and learn with . . . This is a fast-reading Spanish lesson that will enrich anyone's Spanish vocabulary." ""Your hair is your pelo, your nose is nariz. Your grandmother's pelo is probably gris." These ridiculous rhymes using everyday words will tickle and teach at the same time. It won't be long before your young reader is reciting all seventy Spanish words. You'll find a glossary in the back." - Valerie V. Lewis and Walter M. Mayes.